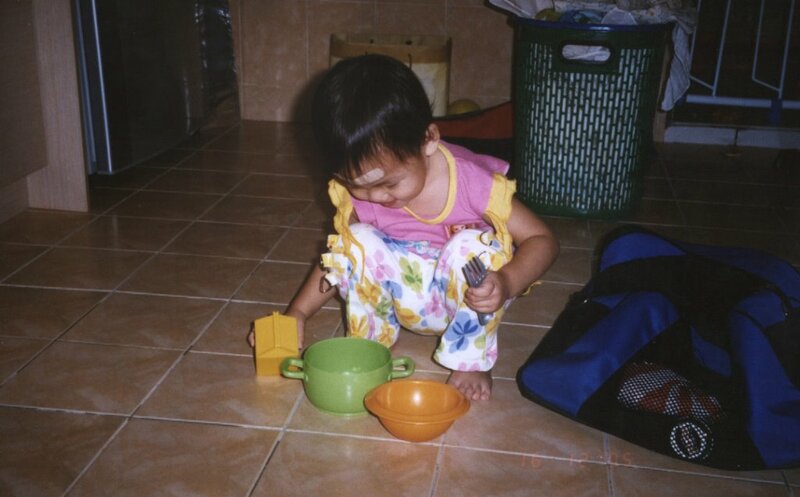 Yesterday night while I was in the kitchen doing some chores, Princess came in and took some of her toy plates, pots and cutleries. Squated there talking to herself. She went something like “Mummy want to eat .. ok I cook noodle. Ok Titi want to eat noodle … I cook”. Pretending to cook and handling us the “cooked” food. I played along and “ate” up everything. And she was sniggering away. Wish I could capture a video on her doing that but it was upstairs. A picture I managed to snap with my mobile although not too clear. Wonder why she had a plaster on her forehead? She requested for the bandage. Well, she was bouncing on the bed and suddenly she bumped her forehead and the timber flooring. Gosh! The forehead developed a huge bump right-after. It was big swollen. Within days, while recovering she was playing with her cousins and she fell on the same spot again and it went swollen again. It was 1 week ago. Now I can say that she has recovered completely. This entry was posted on Tuesday, December 20th, 2005 at 4:12 pm	and is filed under Travel & Fun. You can follow any responses to this entry through the RSS 2.0 feed. You can leave a response, or trackback from your own site.